A Typical Kendo Class . . .
. . . starts with a warmup. Basic stretching, large swings of the shinai, enough activity that you’ll hopefully break a sweat and be warmed up. The next step is a short meditation so Kendoka can clear their minds and focus on their training. Everyone bows and then the practice starts. First up is basic practice which consists of footwork drills and the practice of the basic strikes men (head), kote (wrist) and do (side). Beginners will often practice these elements for the entire class, sometimes on their own (stopping their shinai where the target would be ) or with a motodachi (partner) who allows them to hit the target. Kendoka who have progressed to wearing bogu will usually start with the same drills as beginners, then move on to more advanced techniques. 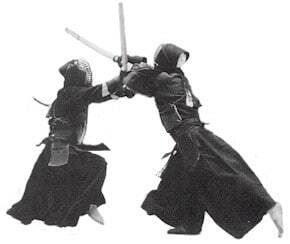 Faster strikes of the same target areas as well as combination strikes (kote-men, kote-do) will be practiced. Tsuki (throat) strikes may also be practiced. up and practice their techniques by sparring. Keiko is practice, not competition, and it is perfectly acceptable to have your partner score lots of points on you. The point of Keiko is to practice so even if you only make one technique work once, or if you at least improve your technique, you have had a good Keiko session. Keiko is limited to Kendoka with bogu. After Keiko, there is another bowing ceremony at which point everyone thanks the Sensei and each other for the practice. Once practice is done, Kendoka often retire to some licenced establishment for refreshments, food and to swap Kendo stories.